Below is sourced from The Statesman, 13 November 1995. It is one of the very early reviews of Bombay Jayashri by renowned Carnatic critic, Subbudu. Her concert on November 4 at the Constitution Club under the part auspices of Bharat Sankalp of Swarazaya was an evening to cherish. It had all those little extras that differentiate the memorable from the enthralling. Though one felt that the miniscule hall such as the one that was chosen for the purpose was inadequate, with people first spilling onto the aisle and later to the adjoining lawn; the moment Jayshree started singing, every discomfiture was forgotten. Bharat Sankalp must take a sankalp (vow) not to put round men in a square hole. The audience sat in mesmerised awe through a session of Carnatic music at its panoramic best. In every concert, there is the inevitable lapse of swara, owing to the physical and intellectual demands of classical music. I was amazed to find no such blemish in Jayshree’s performance. She has successfully combined the vocal ethics of Hindustani music with the grammatical intricacies of the Carnatic system. There is neither gimmickry, nor artificiality in what is an astounding display of sheer vocal brilliance. Constitution Club resonated with Jayshree’s fare, which had nothing unconstitutional about it. 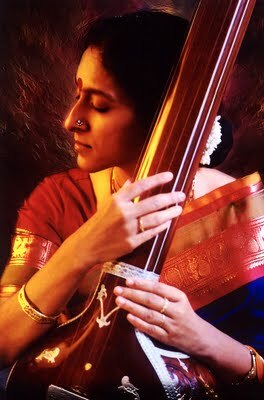 Her Pallavi in raga Shanmukapriya was a definite not-to-miss. Unlike the established manner, Jayshree’s effort was not verily a grammatical exercise, but a soulful rendering, soaked in melody. Her ability to gauge the pulse of the audience was evident in the manner she converted it into a raga malika passage. The variations in Begada, Valaji, and Hamsanandi were equally euphonic and left the audience spellbound. Each note nore the signature of its parent raga and heightened its effect. Each and every rendering was a musical masterpiece. Kambodhi shimmered like a lake by moonlight, in Dikshitar’s Shri Subhramanyaya Namaste. The intrinsic import of the mode was adroitly expressed, rendered in a manner reposeful in slower portions and brisk in the quicker ones. The accompanists too displayed rare aptitude and coordination. Competition on a concert podium is healthy only up to a certain point. The relation here was one of constructive camaraderie, and made the musical evening a stirring offering. M.R.Gopinath was apt in his violin accompaniment, and particularly distinguished himself in his retorts in the Pallavi. ‘Neyveli’ Narayanan did not spend his time selling lignite either. The ease and skill with which he mixed Thisram and Mishram in the Adi tala Kambodhi kriti spoke volumes of his ability. The Thani avarthanam too was a thing to remember. Jayshree also weaved her spell in “Aadamodi Galade” in raga Charukesi. Purists and laymen alike would remember and cherish such a majestic rendering for its melodic excellence and lyrical purity. Another characteristic of Jayshree’s music is her ability to entwine Hindustani intonations in Hindustani ragas while maintaining the purity of Carnatic ragas. For instance, Ahir Bhairav and Des were authentic Hindustani paraphrasings, whereas the Carnatic purity of ragas like Kambodhi was protected. Also, the Hindustani element did not stand out, but mingled beautifully in her singing. The audience, which sat riveted by the sheer melody of the evening’s performance, stood together in a standing ovation to an artiste who undoubtedly has the makings of an all-time great.